Professor Moses received the honour for her ‘distinguished service to higher education through senior academic management positions in Australian universities, and to a range of community and church organisations’. 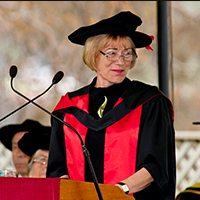 Over her career Professor Moses made a contribution as chancellor, vice-chancellor and professor at various universities, as a chair to an array of higher education and social welfare boards, and as a Director of a Centre for Learning and Teaching at the University of Technology. As Vice-Chancellor of UNE from 1997 to 2006, Professor Moses said she was proud of her work towards restoring the University’s morale and finances. “I set out to create a sustainable future [for UNE] in which people believed, and when I left that had been achieved,” she said. She was also instrumental in establishing the UNE Foundation and the UNE Country Scholarship Program; assisting countless students pursuing their dream of attending UNE. Professor Moses said she believes that everyone deserves access to tertiary education. I’m a believer in the power of education and social justice. People should have access [to education] and we need to enable people to get that access. To this day Professor Moses is a donor of various scholarships at UNE, and maintains the importance of such programs. In 2006, after eight and a half years as Vice Chancellor of UNE, Professor Moses went on to be Chancellor of the University of Canberra until the end of 2010. Following her role as chancellor, she became Chair of Anglicare NSW South, NSW West and ACT, while also maintaining other social welfare and educational board memberships. While Professor Moses has now retired from academic roles in higher education and from the boards of diocesan agencies, she has various pro-bono positions for social welfare and cultural groups that are “close to her heart” including Friends of the National Library Committee and Christians for an Ethical Society. “All of these organisations perform extraordinarily important roles in society and couldn’t function without volunteers,” she said.